Duncan, I can’t wait to read your post. You will have to finish it soon. Yes?You always include the most minute detail – I love it! So even though I used the beeswax + copper combination, I didn’t get that super dark crust. Any thoughts why? Those moulds are a a sight to behold, and a fine investment I’m sure! I like the idea of batters that can be made ahead and left in the fridge, especially one that lasts up to 4 days! Thanks for sharing Julia. 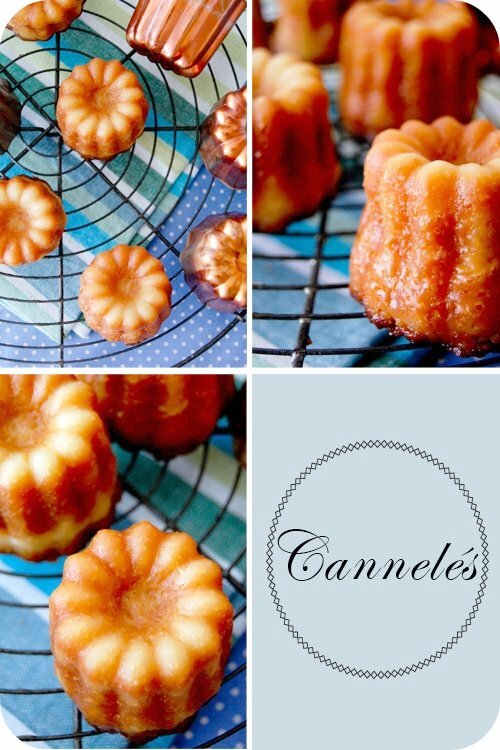 J’adore cannelés ! Oooh I am so excited that this is the current featured French sweet. Whenever I am in Paris – of course I go to Pierre Hermé like many people do… but I don’t actually buy his macarons. I get his cannelé (and tablettes de chocolat too !). I have so many recipes for them, and even silicon cannelé molds, but just never made them – knowing they wouldn’t come out perfect, so dark on the outside, with that thick rigid shell, and almost custardy on the inside. But now I’ve got your recipe – and plenty of inspiration. You even used beeswax? Bah dis-donc, you do continue to amaze me ! I coveted those molds..and bought a good quality silicone one instead.. I’ll come back to your recipe when I make them again..I like my mold..but you know you should have bought what you really wanted when you see them and still covet.. They photographed beautifully..you made them proud. Looks complicated but delicious. I wonder if the French bakery downtown in Ottawa sells them? Splendid! I’d love to find such moulds here! Mine fell apart taking them out of the moulds. I used butter as I could not buy beeswax at the time. These look fabulous! I’ve never eaten a Cannelé. I think I’ve been missing out! I recently tried some too, but although others liked them, I wasn’t a fan. Ohh I want one now! The golden crust on the outside looks amazing. I didn’t know they used beeswax, how intriguing! Aren’t those copper moulds pretty? I am sure they will be a worth while investment. Oh and to answer your question Julia yes I have the black Wilton colour and it is quite good so far. Although I have only used it for colouring small amounts of fondant black and to paint with. But for those applications it works well.